Some days back, I visited cafe rabelais for a lunch with my friends. I must say they were amazing as usual. I really love this small French cafe in Houston, Texas. This cafe undoubtedly serves the best bread in the city. It’s thick, fluffy, handmade and soft. The best part of this cafe is that they give you generous baskets of bread. I think it’s the French roots that make them so nurturing. Well, another thing that reminds you of their French roots is the food that is always fresh. Since, the chef changes the menu twice in a day. 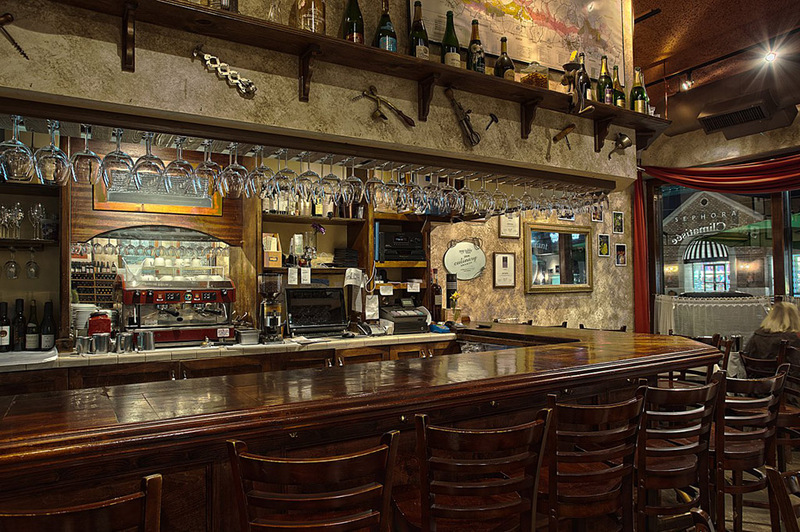 Their food is aromatic and takes you in the interiors of a French countryside. Me, particularly, can’t get their muscles out of my mind. They are cooked in butter along with white wine sauce and onions. My second favorite are the escargots. They are juicy, buttery and simply delicious. They have a simply great list of wines. Of course they prefer vins du français (french wines) that go along with their tasty appétit français (french food). This is really interesting because you get to taste the culture even when you are in Houston. They have insulated walls. Being in Rice village, Cafe Rabelais, has got a huge parking space especially when there are not too many shoppers around. 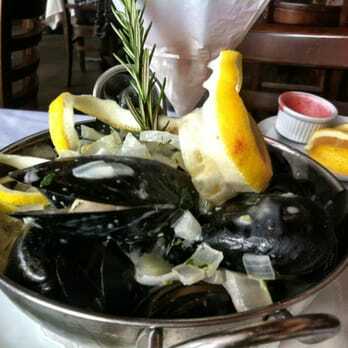 a) Mussels Rabelais: As mentioned above this is my favorite dish among the rest at the cafe. You get around 32 huge mussels that are extremely tasty. They have a perfect flavor of butter, white wine and many onions. I would surely recommend the eating the mussels. 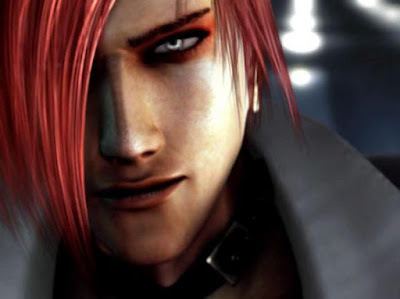 You might dream of them for several nights to come. b) Escargots: Tasty and buttery these snails are just simply fabulous. They are savory and flavored with buttered garlic. Each bite was pure ecstasy and I just couldn’t get enough of them. They serve six pieces per dish, but I don’t think that was enough. c) Tart of the Day: Yes, that’s right, they have a special tart of the day that is all yum. I have tasted 3-4 until now and all of them have been “délicieux”. This time I had a Pistachio and Pumpkin Seed Praline Bavarian Cream Tart. The name of Bavarian cream makes my mouth water. It is the fluffiest cream ever. The tart was also delicious, but I would prefer the previous ones over this one. I think this is the most important part for most readers. I can say that their service is good (generous bread basket!) and the prices are also good. 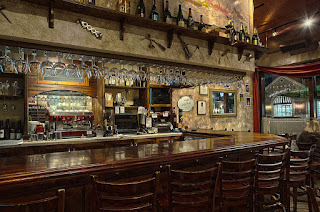 Now, let’s get down to the specifics, the tasty mussels rabelais are priced at $16.00, the amazing escargots at $8 and the tart of the day comes for a good price of $7. I can say the prices fall in the “alright” category, but if you are specifically looking for French food, then they might be “great”. 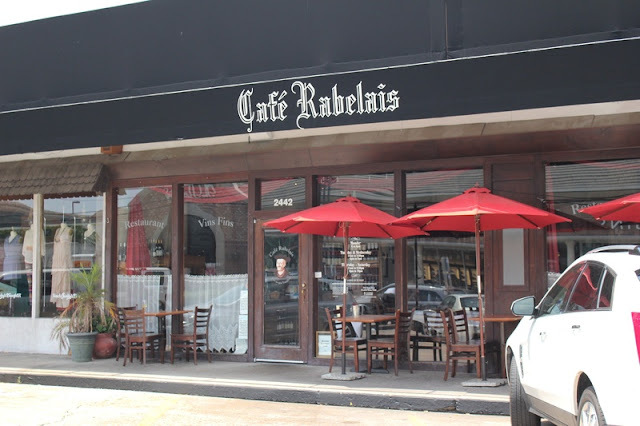 I can say that Cafe Rabelais is simply “Cafe Fantastique” because you can taste authentic French cuisine in Houston, Texas. It gets a generous five star rating. Of course, I love going there again and again!